This is a matchup between a perennial playoff team and a team on the rise. The Connecticut Sun are back in the playoffs for the first time since 2012. Since that time, Phoenix has played 23 playoff games, advanced to the semifinal round or better four times and won their third WNBA title. The discrepancy in playoff experience between these teams is downright gaudy. Connecticut’s entire roster has played 875 playoff minutes and scored 302 points combined. Diana Taurasi by herself has played 1,566 minutes and ranks second in WNBA playoff history with 1,009 points. In all, the Mercury roster has nearly three times as many games played, more than four times the minutes played and six times the points scored in the postseason over their second round opponent. While the Mercury have experience on their side, it’s the up-and-coming Sun that have home-court advantage in Sunday’s matchup (3:00 ET, ESPN2). Connecticut is 12-5 at Mohegan Sun Arena this season, winning both of their matchups with the Mercury on their home floor. In addition to seeing Diana Taurasi back in Connecticut where she had enormous success in college, this game will feature a matchup between two of the best post players in the game today in Brittney Griner and Jonquel Jones. The 6-9 Griner led the WNBA in scoring this season (21.9 ppg) as her offensive game caught up to her already award-winning defense. On the other side, Jones has been the breakout star of the WNBA this season. The 6-6 forward/center led the league in rebounding as she corralled a WNBA-record 403 rebounds for an average of 11.9 per game to go with 15.4 points and 1.4 blocks a night. 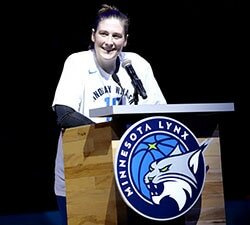 Her 20 double-doubles matched Minnesota’s Sylvia Fowles for the league lead. The Sun won the series 2-1 with the home team winning all three games, all of which took place in the final month of the regular season. The first matchup of the season was the most competitive with the Sun holding off a second-half Mercury rally to escape with a 93-92 win despite a 33-point night from Taurasi as the team was playing without Griner due to injury. Jones (19 points) led a balanced effort from the Sun, which had six players score in double figures. The final two games featured blowout wins by the home teams as the Sun beat the Mercury by 28 points on Aug. 20 behind an impressive defensive effort in the second half. After leading 46-45 at the half, Connecticut held Phoenix to a season-low 21 points in the second half as they cruised to a 94-66 win. Two weeks later, it was Phoenix’s chance to return the favor as they jumped on the Sun from the start (21-10 first quarter) and picked up an 86-66 win behind 31 points from Griner. What the Sun lack in experience that the Mercury come in with, they counter that with a youthful energy that’s helped push them to a 21-13 record; a seven-win improvement over last season. Connecticut ranked second in the WNBA in both points per game (86.0) and pace (81.5 possessions per 40 minutes) this season, which could lead to a high-scoring affair on Sunday. Not only do the Sun play fast, but they also play smart. Their 12.3 turnovers per game was the second-best mark in the league during the regular season. When it comes to scoring, the Mercury rely heavily on Griner (21.9 ppg) and Taurasi (17.9 ppg), who finished the regular season ranked first and eighth in scoring, respectively. Griner and Taurasi also posted the two highest scoring games in the league this season with Griner scoring a career-best 38 points at Indiana on June 7 and Taurasi scoring a season-high 37 at Chicago on June 1. Phoenix has only one other player to average double figures (Monique Currie at 10.2 ppg) followed by Leilani Mitchell at 8.0 per game. Conversely, the Sun feature more a score-by-committee approach. Their leading scorer (Jones at 15.4 points per game) ranked 15th in the WNBA this season. 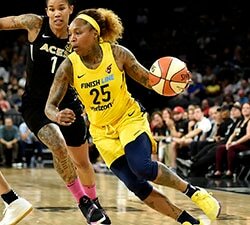 However, she is followed closely by Alyssa Thomas (14.8 ppg), Jasmine Thomas (14.2 ppg) and Courtney Williams (12.3) as the Sun featured four players with scoring averages over 12 points per game, compared to just two for Phoenix. The depth continues as Shekinna Stricklen (8.6) and Alex Bentley (8.4) give the Sun six players that average more points than the Mercury’s fourth-leading scorer. In terms of how each team scores, both teams rely on the 3-point shot for nearly a quarter of their offense. The biggest discrepancy comes at the free throw line. The Mercury ranked second in the league in both free throws made (18.1) and attempted (23.0) as they get 22.2% of their points from the charity stripe. Griner led all players with 7.3 free throw attempts per game, so Connecticut’s ability to defend her without fouling will be imperative to their success. 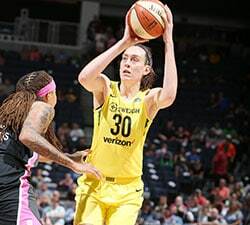 In Phoenix’s first round win over Seattle, both Griner and Taurasi attempted eight free throws as the Mercury went 28-30 from the line as free throws accounted for 35.4 percent of their offense. This game features five of the 24 players selected for this year’s All-Star Game with the Sun trio of Jonquel Jones, Alyssa Thomas and Jasmine Thomas each earning their first selection. The Mercury featured eight-time All-Star Taurasi and four-time All-Star Griner, who was unable to play due to injury. Any list of players to watch has to start with these five standouts. As mentioned earlier this game features the league’s leading scorer (21.9 ppg) and shot blocker (2.5 bog) in Griner and the record-breaking leading rebounding in Jones (11.9 rpg). Speaking of records, Taurasi became the WNBA’s all-time leading in both points scored (7,867) and 3-pointers made (996) this season. For Connecticut, Alyssa and Jasmine Thomas finished the regular season ranked fifth (4.5) and seventh (4.3), respectively, in assists per game. The duo also ranks in the top five in steals per game with 1.6 per game apiece. 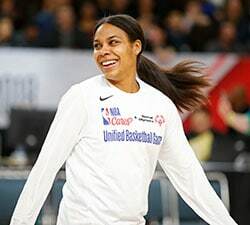 Alyssa Thomas joined L.A.’s Candace Parker as the only two players to average at least 14 points, six rebounds and four assists on the season.